This section is meant to be a brief overview of the Uniforms for the 101st during WWII and what items would traditionally be worn with them outside of combat. For instructions on how to wear the uniform and obtain that authentic battle look please see our impressions page. The reinforced M42 is the iconic Paratrooper Uniform worn during Operation Overlord and D-Day. While only worn from approx April of 1944 to August of 1944 this has been the bread and butter of an Airborne Re-enactor's wardrobe and normally the first purchased when getting into the hobby. 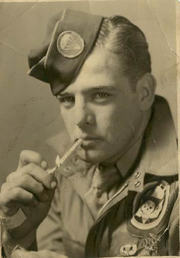 From Mark Bando's website Trigger Time " The classic American paratrooper uniform of WW2 was the M42 jumpsuit. 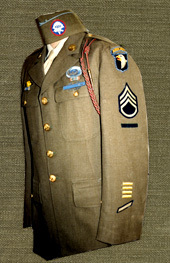 Designed by LTC William P.Yarborough, they featured characteristic slanted belows pockets and flaps secured by two snaps on each flap, Wear began in 1942 and ended some time in 1944. The 101st M42 suits were turned-in after Normandy, to be replaced by green M43 combat suits for the duration of WW2. " You will need both the M42 Reinforced Coat and M42 Reinforced trousers. Shades vary but most will look very khaki colored to light green. Note the Reinforced patches on sleeves, pants and pockets. D-Day Impression notes: The M42 should be worn with a white T-shirt and a wool shirt underneath. Fox Company also wore a white lanyard on their left shoulder. This served to help easily identify their Company after landing. 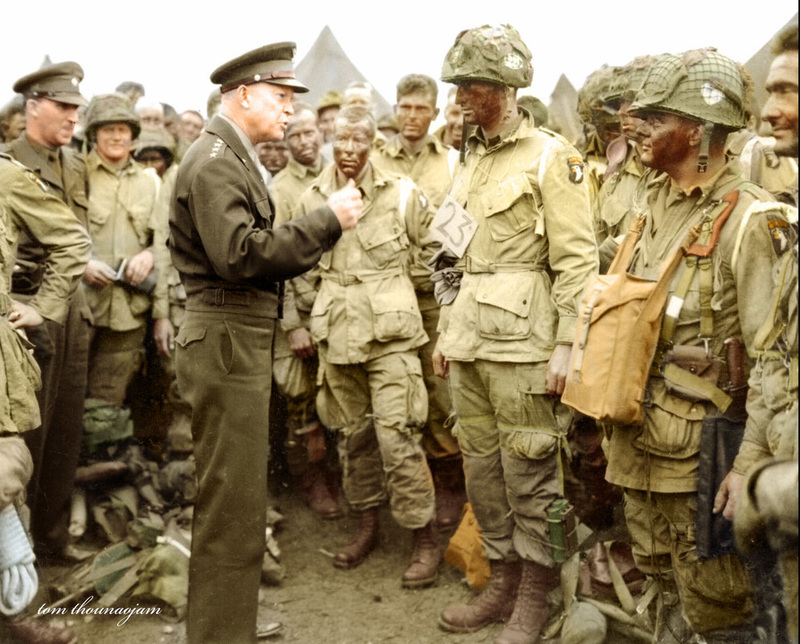 It can be seen in the famous photo of the 502nd with Eisenhower below. We normally take an old white T-shirt and cut off about 1/2 inch think piece off the bottom. Boots, Parachutist, Russet "Jump Boots"
These boots are one of, if not the most, important part of your uniform. They were the signature of the airborne forces in WW2. You will take pride in wearing these boots as they signify you as a paratrooper, an elite soldier who has EARNED the right to jump boots. These boots should be polished for public display events or when wearing the Class A or Class B Uniform. For battle events or tacticals where a full combat uniform is portrayed the boots may be dirty and scuffed up, giving the lived in impression. 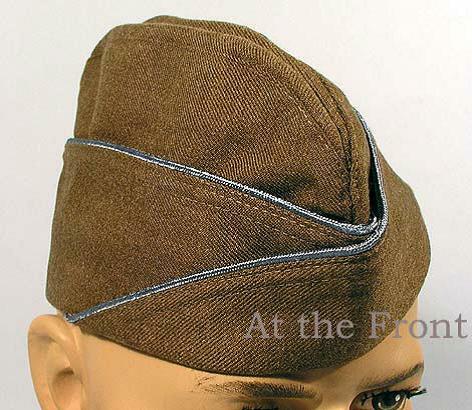 The proper Garrison cap with a parachute infantry cap patch and blue infantry braid. 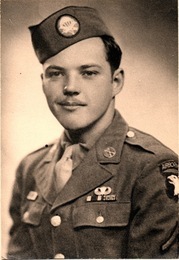 Enlisted Men wear the patch on left side on the Garrison cap (pictured below), while officers wear the patch on the right side with their rank on the left side. Once the 101st was relieved from front line duty in France, they returned to England to refit and resupply. Part of the resupply was the introduction of the M43 Uniform. This was designed to be a better uniform for colder weather and offered extra buttons for hoods and liners to be added. You will need an M43 top and M43 rigger modified trousers. Airborne forces also had a 48 star flag sewn or a 48 star armband (both are pictured at left) during Operation Market Garden only. The M43 was the Uniform worn for the remainder of the war for Airborne forces so this is a great item to purchase. More battles are doing later war impressions instead of D-Day battles. Also part of the resupply was the introduction of double buckle boots. Many paratroopers refused to wear the double buckle boots in favor of their hard earned Jump Boots. Either boot is appropriate for this impression. 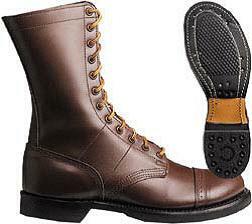 Troopers who have purchased double buckle boots enjoy an easier and more comfortable boot to wear. Always a good purchase new or used. 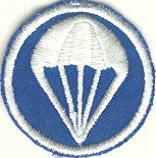 Introduced in August of 1944, the late war patch combined both Airborne and Glider forces under 1 patch. 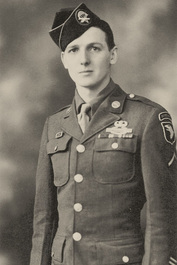 Many Airborne troopers resented having Glider forces combined under the same patch and sewed the glider patch with its nose pointed downward to signify how the gliders crashed landed. 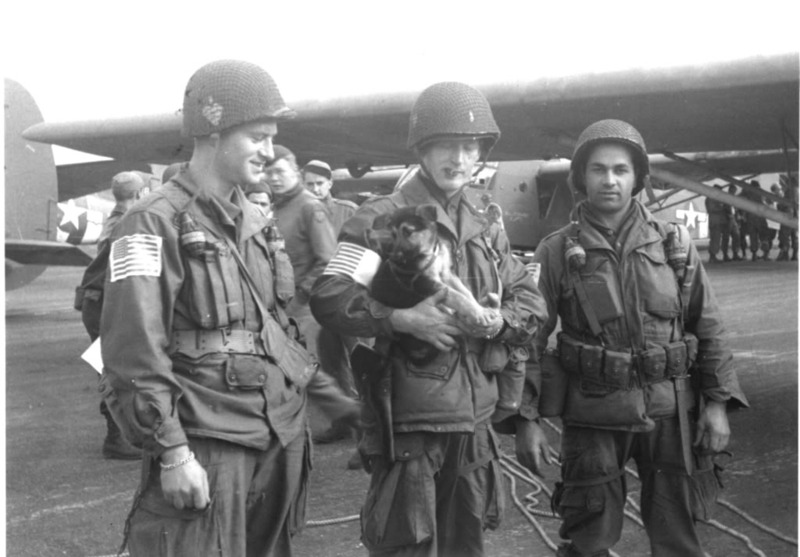 Other Airborne troopers had a high respect for the Glider forces. Any trooper who was willing to get in a wooden box, go through enemy flak fire and crash land was deserving to get equal pay and be part of the Airborne forces. The Battle of the Bulge breaks the rules of impressions by combining everything into 1 category. Guys grabbed anything they could get their hands legally or otherwise to keep themselves warm. The Standard Uniform was the M43 and that should be worn by everyone without any US Flag. When it comes to Outerwear things get interesting. From Tanker jackets to Mackinaws (officers or enlisted), Overcoats, or simply 43's everything is game. Instead of an overseas cap a jeep cap is perfectly acceptable. What I love about the above photo is that some guys have overcoats, some only 43's. Different gloves are shown and most of the guys are lucky enough to have overshoes and variations of scarves and also seen. Below are pics of an overcoat, overshoes and a scarf. While overcoat for bigger guys are harder to find, just remember that they run huge. Never be afraid to try one on as they were meant to go over many layers of clothing. Your body will love you for it during a long cold tactical in winter weather. The M43's are still the uniform of the day and double buckles mixed with Jump Boots are the acceptable footwear. The M43 would not be worn with a US Flag and many times rank. Most 101st troopers cut the legs ties off of their Rigger modified M43 trousers, but as we do multiple time frames keeping them is allowed and preferred. The standard 4 pocket blouse was worn from the start of WWII all the way until the 2 pocket Ike Jacket was introduced in early 1945. Introduced in 1945 and named after Dwight Eisenhower, this new Class A became the standard dress Uniform. 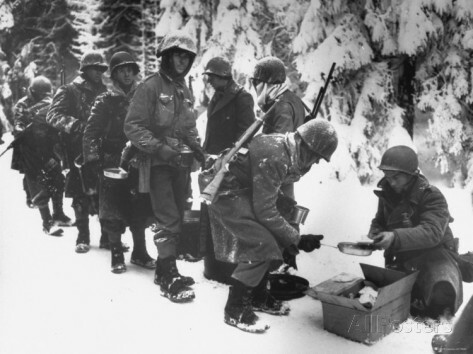 Many troopers wore either the 4 pocket or the Ike jacket depending on preference.